One of the most famous Byomkesh Bakshi stories written by Saradindu Bandyopadhyay is Pother Kanta (also transliterated as Pather Kanta, পথের কাঁটা). The story was also exceedingly popular in the Basu Chatterjee-directed television serial aired on Doordarshan. Most readers (and viewers) are intrigued by the innovative weapon used by the criminal in the story. 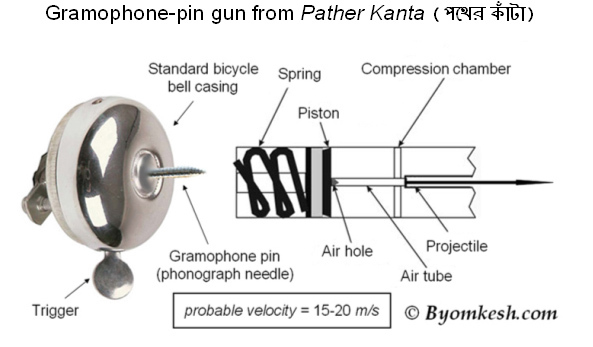 The use of a standard bicycle bell modified into an air-gun capable of firing a steel gramophone pin (often called phonograph needle in many parts of the world) captured the imagination of fans all over the world. In my own opinion this story ranks up there with “The Speckled Band” which feature Sherlock Holmes in creating a vivid, lingering impression. I enjoyed the concept so much that I actually created the article on Pother Kanta on Wikipedia. We will discuss this story in many articles, but our focus here is on the weapon itself. Is it physically possible to create a lethal bicycle-bell gun that obeys the laws of physics? This question is vital to fully appreciating the story. First, let us consider the projectile, the gramophone needle or stylus. Although the use of this sharp object as a weapon is innovative, the use of needles has been attempted many times. The Dreyse needle gun was a breechloading rifle that fired needle-like projectiles in the 1800s. It fell out of favor because of a short-range. Of course this gun had a powder charge, but the reason it was not used frequently was because of short range of accuracy. In Pother Kanta, the assailant fired from a distance of no more than 3-4 meters. In these short distances, sharp needle-like projectiles are very accurate. In fact, other types of needle-guns have existed for years as well. The benefits of shooting sharp needle like objects is that they have a very high muzzle velocity once fired. Another factor that would allow a bell mechanism to shoot gramophone needles is that recoil from such a weapon would likely be minimum. In Pother Kanta, a single gramophone needle pierced a victim’s heart at close quarters. The question of height of the victim comes into play. For victims of different heights, different angles would be necessary, although this could be modified by an expert marksman by tightening the bell. The question of whether the gramophone needle could pierce the sternum is also an interesting one. With sufficient velocity, it is possible that incident ricochet would allow the needle to pierce the heart, although not cleanly. So far, the story is quite accurate. 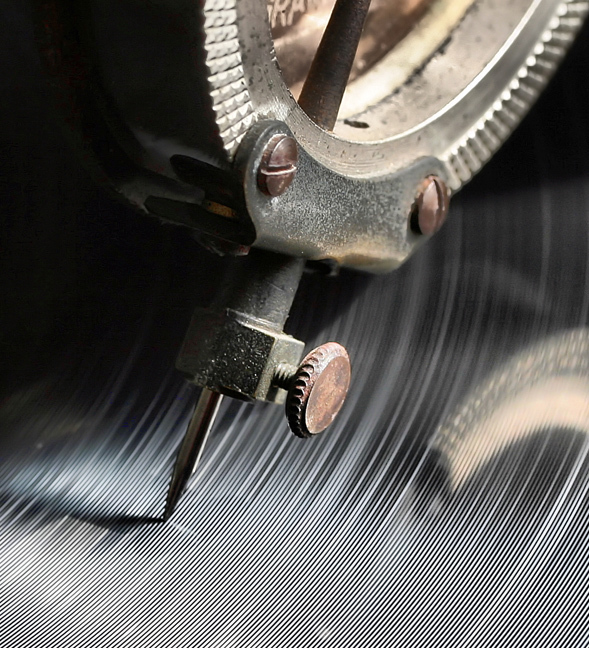 The other brilliant bit behind the weapon is that because gramophone needles are usually made of steel and other hard metals (as opposed to lead), at close distances and high velocities they might even pierce through and leave through exit wounds. So, no trace of the projectile would be found inside the body! I have presented a scheme for a possible spring-piston gun mechanism that might be able to propel a gramophone needle towards a victim. Extrapolating from actual data on maximal velocities achieved by firing pellets from spring-piston mechanisms, I have calculated that the bicycle-bell gun might have a probable velocity of 15-20 m/s which would be enough to inflict substantial harm to someone wearing light layers of clothing. Of course, all of my calculations depend on the assumption that relatively high tensions in the spring can be created to generate sufficient kinetic energy upon release. This is the “black-box” of the whole theory and very hard to determine without computer simulation. Nonetheless, as I have demonstrated, if we use a bit of imagination, this sort of weapon is plausible. This is the eighth part of a series of trivia quizzes on Byomkesh Bakshi. This quiz is based on the story, Monimondon. If you’ve read the story or seen the television episode, then you should have no trouble answering these questions. 1. What was stolen from Rasamoy Sarkar’s house? 2. What was Bhola’s role in the household? When asked by Byomkesh Bakshi what he did outside the Sarkar household for one hour that evening before the theft, what did Bhola say? 3. Where did Bhola’s brother, Bhootnath work? 4. Who was the Police Inspector investigating the case? 5. What was the gift that Rasamoy Sarkar brought from his father for Byomkes for solving the case? Who finally got to keep this gift? 6. What was the animal that Ajit teasingly called Byomkesh because he never spoke? 3. Bhootnath was a worker in the Postal Department. He was responsible for removing letters from postal-boxes in the area. 4. Inspector Amaresh Mandal was investigating the case. 5. Rasamoy Sarkar brought a diamond ring as a gift from his father. Satyabati took it at the end of the story. 6. Ajit said that Byomkesh was a tortoise (কচ্ছপ) to Satyabati. ©2010-2012 Byomkesh.com. All rights reserved. This is the seventh part of a series of trivia quizzes on Byomkesh Bakshi. This quiz is based on the story, Dushtochokro. If you’ve read the story or seen the television episode, then you should have no trouble answering these questions. 1. What was Bishu Pal’s profession? How did he know Dr. Suresh Rakshit? 2. According to Bishu Pal, how what was the collateral (জামানত) for which he loaned Abhay Ghoshal 30,000 Rupees? 3. What was Ramapatibabu’s role in the case? 4. How did Bishu Pal convince the police medical team that he was paralyzed? 5. What was the demand that Byomkesh Bakshi made to Bishu Pal in order to keep quiet? 1. Bishu Pal was a moneylender (মহাজন). Dr. Suresh Rakshit was his family physician and a tenant. 2. According to Bishu Pal, he didn’t take any collateral at all. He only made Abhay Ghoshal sign a promissory note. 3. Ramapatibabu was the Officer-in-Charge of the local Police Station investigating the murder of Abhay Ghoshal. 4. Bishu Pal got Dr. Rakshit to inject him with the local anesthetic procaine before medical team showed up. This fooled the physicians into thinking that he was paralyzed from the waist down. 5. Byomkesh Bakshi was not convinced that the case would stand in front of a jury because the motive establishing that Bishu Pal killed Abhay Ghoshal was weak. So he demanded that Bishu Pal deposit one lakh Rupees in the National Security Fund. This is the sixth part of a series of trivia quizzes on Byomkesh Bakshi. This quiz is based on the story, Makorshar Rosh. If you’ve read the story or seen the television episode, then you should have no trouble answering these questions. *1. To what substance was Nandadulalbabu addicted according to Ajit’s former school friend, the physician Mohan? 2. What was inside the parcel that Rebecca Light regularly used to send to Nandadulalbabu? 3. What brand of pen did Nandadulalbabu use to write his vulgar stories? 4. What was the colour of Nandadulalbabu’s tongue? This is the fifth part of a series of trivia quizzes on Byomkesh Bakshi. This quiz is based on the story, Uposonghaar. If you’ve read the story or seen the television episode, then you should have no trouble answering these questions. 1. What brand of matches did Byomkesh and Ajit use? What was the brand it was replaced with by the suspicious stranger that Byomkesh met? *2. What was the name that the villain used to introduce himself by in Uposonghaar? What was his actual name? *3. What is the name of Byomkesh’s faithful servant? 4. How did Byomkesh’s servant remember the number on the taxi that the villain used to escape even though he didn’t know any English? 5. What was the name printed on the letter given to Byomkesh? (Hint: Byomkesh couldn’t remember knowing anyone with this unusual name). *6. What was the name of the newspaper that Byomkesh read? Whose death in Srirampur was published in this newspaper? 7. The villain took two items that in clear view when he escaped from his quarters. One was a hand-bag; what was the other item? 8. What was the price of the matchbox as advertised in the newspaper? 1. The used the “Horse brand” matches (ঘোড়া মার্কা). The stranger had exchanged it the Satyagrahi brand (সত্যাগ্রহী). *2. Anukulbabu who Byomkesh first met in Satyanveshi introduced himself as Byomkesh Bose. 4. It is true that Puntiram didn’t know any English. Due to extremely good fortune, the number on the license plate which he saw was 8008 (in English) which Puntiram recalled to Byomkesh as 4004 since it resembles ৪০০৪. The character for the number “four” is “৪” in Bengali/Bangla. 5. Kokonod Gupta, a rather odd name that the villain used to indicate his association with cocaine in Satyanveshi. This is the fourth part of a series of trivia quizzes on Byomkesh Bakshi. This quiz is based on the story, Khunji Khunji Nari. If you’ve read the story or seen the television episode, then you should have no trouble answering these questions. 1. What was the smell coming from the bottle of glue in Rameswar Ray’s room in Khunji Khunji Nari? 2. What was the main reason that Labanya, daughter-in-law of Rameswar Ray, didn’t want to employ any servants in the household? 3. Why did Rameswar Ray need to write a last will and testament document to bestow part of his property to his daughter, Nalini? 4. Nalini’s husband, Debnath mentions that there needs to be two witnesses present for a will to be legally binding in Bengal. Byomkesh mentions that there is an exception. What is it? 5. Where was the letter which Rameswar Ray sent to Byomkesh and Ajit misplaced? 1. The smell of pureed onions which Rameswar Ray used to write “invisibly” with. 2. Labanya was afraid that Rameswar Ray would reestablish regular communication with his daughter-in-law Nalini. 3. The story is based before the Hindu Succession Acts of 1956 and 2005, by which a daughter is equally entitled to inherit her father’s estate. If Rameswar Ray didn’t write it out in his will, his daughter would not inherit anything. 4. If the person wanting his or her last will and testament enacted writes it out completely in his or her handwriting it is valid.